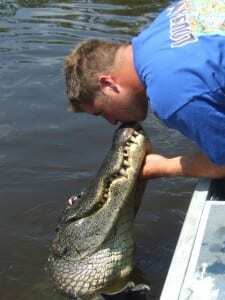 Experience the other Swamp Tour in New Orleans, the New Orleans Airboat Tour. We are only 35 minutes from New Orleans yet a world apart. Hold onto your hat! Airboat tours are a high speed adventure that is part tour and part ride. You will experience the best of both: a swamp tour and an airboat ride. You will travel at high speeds in the airboat then slow down and stop for pictures. Along the way, you will get a personal tour by your local Captain. Our airboats have stadium seating, so that the person in front of you does not obstruct your view. So every airboat seat is great for experiencing the tour and viewing the wildlife. Yes, gators will get close, real close. So close that you will be able to look into those reptilian eyes. The 6 passenger airboat is 16′ in length, has two bench seats that will sit six passengers. This airboat is a little faster and can go in some places that the larger airboat cannot reach. It is a more personal experience. The gator’s get very close, since you are only feet away from the water.